Holiday Cateringwith all the trimmings! VideosSee how we do it & why it tastes soooo good! 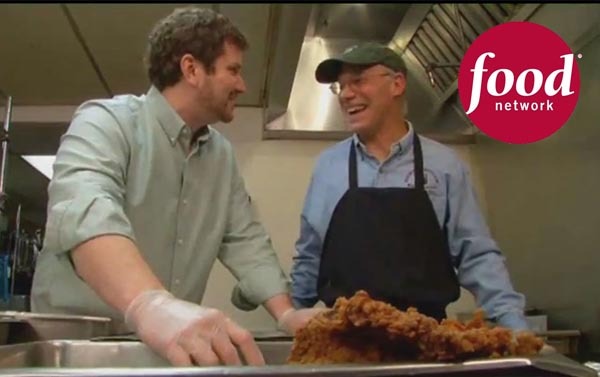 The Food Network featured our OUTRAGEOUS RANCHER CHICKEN FRIED STEAK on OUTRAGEOUS FOOD! Tackle one of these bad boys and you'll appear on our Wall of Fame! See the OUTRAGEOUS FOOD video here. This is Texas. This is real hospitality. This is as good as it gets. Looking for something good? This is the place, a real Texas cafe – you know the kind – where you see the cafe sign on the old town square and imagine how good it's going to be. And even though we're not on the square, you'll be glad you stopped in. Hickory Hollow has been serving exceptional Texas comfort food with Texas hospitality since 1977. We're best known for Texas-style barbecue and chicken fried steak, as seen on The Food Network and The Travel Channel, and have won highest honors for these and other good things, too. The Houston Press says it's the Best Chicken Fried Steak in Houston. The Houston Business Journal Gourmet Choice agrees. Oprah Magazine says it's the Best Value. "Just look at the size of those chicken fried steaks!" HTexas magazine says we have the Best Homemade Ranch Dressing. But don't take their word for it. Read what our guests say. Better yet, come on in and experience it for yourself! Become a Royalty Rewards favorite guest. You'll get rewarded for every time you visit us! With special saving opportunities, no-strings-attached freebies, announcements, and more. It's called the Hickory Hollow Royalty Rewards program. It's really simple. Just sign up and you'll become a favorite guest and you'll be rewarded for it!